Currently, lithium-ion batteries are only recycled in small quantities, but we have the opportunity to take charge. Imagine a pile of batteries. A really big pile – 3,300 tonnes worth. Every year, Australia produces approximately this much lithium-ion (Li-ion) battery waste. Only 2% of that pile of batteries is recycled. And the pile is growing by 20% per year and could exceed 100,000 tonnes by 2036 (that’s about equivalent to two Sydney Harbour Bridges). Currently, the majority of the pile of batteries is shipped overseas, and what remains is put into landfill. This can lead to potential fires and environmental contamination. Given our lacklustre Li-ion battery collection, combined with costs of transporting and landfilling of this waste, and the missed opportunity on reusing battery components, we estimate the cost to our economy at between $813 million and $3 billion (based on current day commodity prices). Like battery technology itself, it’s not all negatives, and there are some opportunities for improvement. Li-ion battery waste contains a whole host of valuable resources like cobalt, lithium and graphite that could be recovered. 95% of these components can be turned into new batteries or used in other industries. Large-scale battery recycling is not a new concept, and in fact 98% of the 150,000 tonnes of lead-acid batteries sold in 2010 were recycled. We know the waste piles are growing, but why exactly are Li-ion batteries so common? A quick glance at your mobile phone or smartwatch will answer this. Li-ion batteries are a low maintenance technology that hold charge well, compared to other battery types. Lithium atoms and ions are very small and light, so a lot of energy can be stored (meaning a high level of energy density within the battery). This means they’re perfect for use in phones, laptops, electric vehicles and digital equipment. Here’s a deeper dive into the pros and cons of Li-ion technology. Although very common in small devices, Li-ion batteries can also suit larger purposes like a household energy storage system. Or larger still, the 100 megawatt system switched on in South Australia last year. We must increase consumer awareness of recycling options for lithium-ion batteries of all shapes and sizes. Low battery recycling rates can be improved through better understanding of the importance of recycling, improved collection processes, and by finding ways to efficiently recycle materials. A successful recycling industry would benefit from addressing some information gaps around economic modelling and life cycle assessments. We must find ‘best fit’ technology processing options for Australia. Since we’re so spread out, that may mean that mobile processing could be viable. Perhaps we could even join forces with smaller neighbouring countries! When you examine the economics and the environmental implications, an onshore li-ion recycling industry could certainly be on the cards. Our research is supporting recycling efforts, with research underway on processes for recovery of metals and materials, development of new battery materials, and support for the circular economy around battery reuse and recycling. Our battery expert Dr Anand Bhatt and his team are working with industry to develop processes that can support the transition to domestic recycling of lithium-ion batteries. “The development of processes to effectively and efficiently recycle these batteries can generate a new industry in Australia. Further, effective recycling of lithium batteries can offset the current concerns around lithium security and future environmental issues,” Dr Bhatt said. 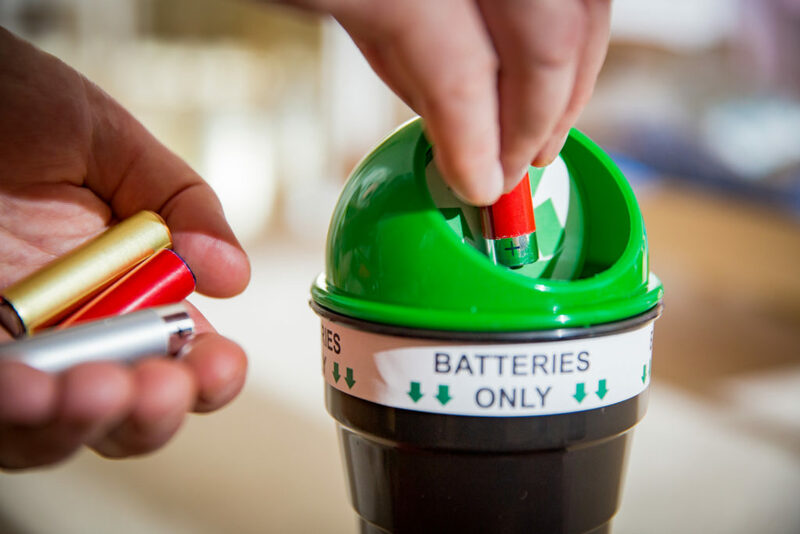 Information on battery recycling can be sourced from the Australian Battery Recycling Initiative or from Planet Ark. Want to know more about energy storage? Here’s your outlet. We’re plugged in to the latest technologies, from thermal energy, batteries and ceramics. Agree, A great idea Tom. How about getting the government to classify lithium-ion batteries as recycle only rather than the current definition as landfill. How about a deposit refund scheme to incentivize recycling Li-ion batteries – all batteries for that matter! Clean TeQ can recycle lithium-ion batteries.